Arm Treasure Data offers a cloud-based analytics platform for customer data and for management of data for the Internet of Things (IoT). Our platform delivers continuous data integration of end-to-end data pipeline data through easily accessed interfaces. Using our seamless interface, you can bring in raw data or other types of data from various sources, you can run queries against the data, set up workflows to manage the data, and create data models from your customer data. You can segment your customer data and export your data for use in campaigns or to be further enhanced by other vendor applications. Overabundance of data is now a ubiquitous problem across all departments and industries. Due to the proliferation of smartphones, social media, and device sensors, data is increasing exponentially both in terms of volume, velocity, and variety. Treasure Data meets the challenge by providing unified customer data — on both behavior and attributes —- and an infrastructure that robustly scales without needing to hire an ever larger team of infrastructure engineers. Treasure Data enables companies to deliver the right experience at the right time. Using the Treasure Data platform, you can query and enrich the data, build workflows that orchestrate complex processes, and deliver transformed results in a variety of formats to data stores and applications on premise or in the cloud. You can focus on your data analytics, while letting Treasure Data manage server scaling, storage, infrastructure, and security. Infinite cloud storage capacity, with high availability. Easy to use, and does not require deep knowledge of “Big Data” technologies. You focus on your data and analytics instead of cluster management. Elastic resource allocation that can be scaled up or down at any time. Ingestion Flexibility to your existing data sources and analytics applications without architectural changes. Including connectivity to the large swath of Marketing and Business SaaS applications and tools. Activation with Ease Connect directly to BI Tools for reporting, marketing and sales tools for delivering insights to team members in the field, or use our Profiles API for optimizing experiences in your IoT or Marketing experience in real-time. Treasure Data’s architecture is performance-optimized and secure. Access and ingest your data from new and traditional sources. For example, ingest from mobile, web, CRM, and point-of-sale systems into a schema-free data representation that enables data to be communicated and used by various business units across the organization. Or, you can ingest from your streaming data sources for real-time collection, such as website and mobile applications and IoT devices. You can use our collection tools that work reliably at scale (we currently ingest over 1M events every second). And yet another example, ingest from data sources that collect data with batch processes, such as production databases, CRM SaaS tools, and Point of Sales systems. Leverage our machine learning and query engine to uncover insights that were previously hidden by the complexity of the data pipeline. Or transfer your data seamlessly into systems of your choice, such as data science tools, business analytics tools, and CRMs. 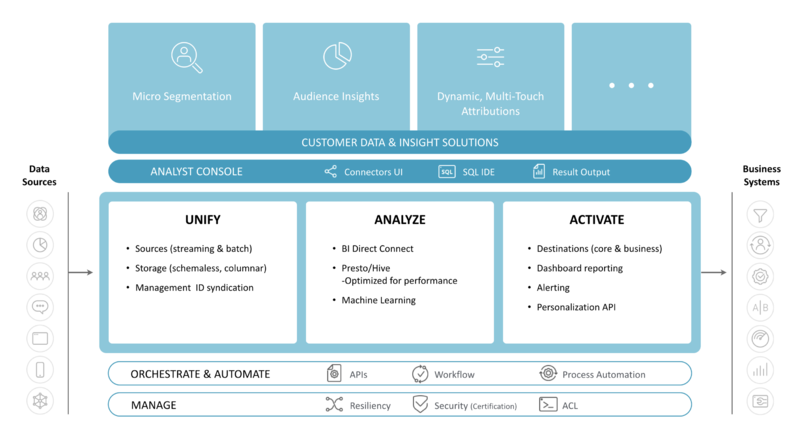 Put analysis to work in real-time by creating orchestrated workflows that leverage extensive integrations and provide services, such as customer audience profiling. Treasure Data provides a data collection daemon, Treasure Agent, which is installed in your existing infrastructure. Treasure Agent collects records from various data sources and continuously uploads the data to Treasure Data’s cloud storage. For many common use cases, you can install Treasure Agent, our data collection daemon, in your existing infrastructure. It can collect records from a wide range of data sources and continuously upload them to TD’s cloud storage. For collecting data from mobile devices, we provide easy-to-use API libraries that you can embed in iOS or Android apps. Treasure Agent assigns a universally unique identifier (UUID) to each chunk of data. Treasure Agent retries whenever it detects network failure. However, the retry can sometimes result in the same chunk of data being sent more that once. When a chunk arrives, to avoid duplication, Treasure Data’s API endpoint inspects the chunk’s ID and discards data chunk if it has been processed in the last 10 minutes. All your data is stored in the cloud as columnar data. This format achieves far better performance and compression compared to existing RDBMSs. The data is stored in Amazon Web Services S3 storage, for maximum scalability, availability and reading and writing performance. We also believe that your data is yours: you can bulk-export your data at any time. Our internal data formats are schema-free, to keep up with the variety of data types and fast-evolving schemas that are increasingly common in big, heterogeneous data use cases. Treasure Data lets you analyze your data using industry-standard Big Data query engines: Presto and Hive. Queries are executed in parallel in our elastic clusters, that can scale to keep up with your demanding requirements for interactive query performance and high-volume batch processing. A built-in export capability is provided for writing summarized data from the Treasure Data store to a traditional RDBMs or Data Warehouse. This enables efficient processing of large data volumes with Treasure Data both as a primary analytics engine as well as a preprocessing platform. Our computing resources are always shared across our users. If a Hadoop cluster dies, jobs are automatically reassigned to another live cluster. Treasure Data also provides a standard JDBC interface for Batch and Presto for data transfer to existing (or future) BI tools. The need for custom coding and maintenance to link these environments with the primary data store is eliminated. We maintain the value of collateral through the curation of processes and technologies. We ensure that you benefit from best practices and tool enhancements, as well as a stability and smooth integrations. Our support team has a deep knowledge base, is highly available and dedicated to helping our customers. Handle the most complex identity unification use cases, by using both a customer data pipeline tool and Treasure Data’s ID Unification. Treasure Data’s unified console gives you full visibility of your data, data sources, destinations, jobs, users and usage information. Start with the unified view of your data that Treasure Data provides. Machine learning makes sense of that data for application into your unique business rules. Through Treasure Data’s interface select your audience and specify segments. Then 'activate' your segments by exporting out segment insights to your team or to BI tools. Through batch or real-time segmentation – your choice – target audiences with personalized email and advertisement campaigns. You can use data gathered from IoT applications for your new product development. Your Data Engineering and Science team can leverage TD’s processing capabilities to build applications against the data ingested at scale with TD. Treasure Data’s technology supports a wide range of industries, including digital marketing, social media, social games, finance, and e-commerce. Gaming Better user acquisition, retention, and revenue. e-Commerce From understanding your customers, to build own recommendation engines. A/B Testing Comparing feature implementations between different sets of users. Marketing Attribution Which contents work better in the customer journey? Automotive Analyze and make sense of data coming from automotives. Read more about Treasure Data, including white papers and case studies, by going to our resources page. Select an integration, either a source for data that you want to bring into Treasure Data or a place to send data. You can select your connector of choice from the console (if you have an account: Treasure Data Integrations) or peruse the documentation, such as importing and exporting data. Manage your data through jobs and TD Workflow. Prepare data for activation using Audience Studio.